Ah, the Railbots. A little history lesson here: In 1991, when Hasbro had stopped distributing Transformers toys to the US market for the time being, and Europe was receiving exclusive Action Masters toys never released in the US (such as Tracks, Sideswipe and Bombshell), Japan was still at the height of the Micromaster craze. Takara's Transformers line for 1991 was "Battlestars" aka "Return of Convoy", which saw the return of Convoy (better known as "Optimus Prime" to Western fans), who had "died" (again) in the third episode of the "Headmasters" cartoon, in the new form of Star Convoy (accompanied by a Micromaster version of Hot Rod aka "Hot Rodimus"). Aside from two other larger "Battlestars" toys also released in 1991, Sky Garry and Grandus, both of which came with their own Micromaster companions, all other Takara Transformers toys of 1991 were Micromasters. Most of them were the Takara counterparts of Hasbro Micromaster teams previously unreleased in Japan, while others were re-releases and redecos of older teams, and all of them were Cybertrons (Autobots), because "evil toys don't sell well in Japan". One release that stood out among all the other Micromasters was the one with the product number C-370, named Sixliner. Consisting of Spark, Deego (aka "Diego"), Alan (aka "Aran"), Joe, Night and Leaf (aka "Leif"), the six Micromasters could merge into a gestalt robot named Sixliner, with extra parts forming the fists, feet, chestpiece, head etc. (very similar to the Generation 1 Devastator toy). At that time, Takara was still sane enough simply to release the entire Sixtrain team as a set, retailing for 2,500 Yen. The following year, in 1992, Takara made the gestalt concept the primary gimmick of that year's Transformers line, entitled "Operation Combination", which featured no less than four Micromaster merge groups, namely TF-01 Sixbuilder, TF-02 Sixwing, TF-03 Sixturbo and, last but not least, TF-05 Sixtrain. The latter was actually a redeco of Sixliner, with Desire being a recolored remold of Spark, San Diego being a straight recolor of Deego, Atlan being a straight recolor of Alan, Windy being an entirely new mold that replaced Joe, Convertor being a straight recolor of Night, and Raise being a recolored remold of Leaf. As with Sixliner, all four teams were released as complete sets by Takara, with each set retailing for 2,500 Yen once again. 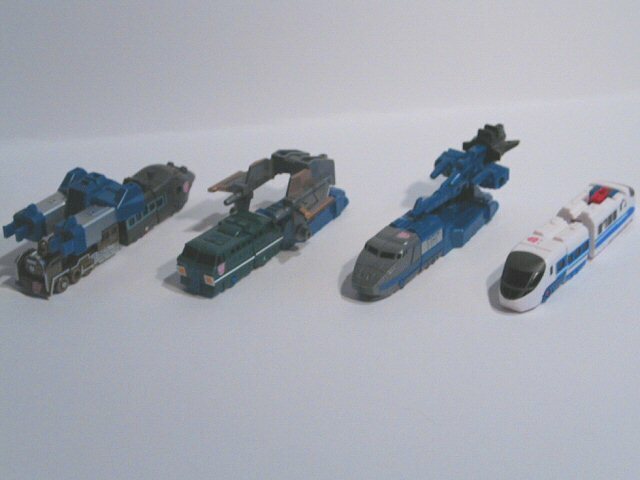 Fast-forward to May 2002, when Takara, having previously re-released the original Convoy (Optimus Prime), Ultra Magnus, Hot Rodimus (Hot Rod), Megatron, Starscream, God Ginrai (Takara's superior version of Powermaster Optimus Prime), Rodimus Convoy (Rodimus Prime) and Sixshot toys in faithful reproductions of their original Japanese boxes, released the first part of a series of Micromaster reissues, once again starting with Sixliner, with all members retaining their original colors. However, this time, the six Micromasters were not released as a set, but instead came blind-packaged in opaque boxes selling for 300 Yen each, with a full case of 12 boxes selling for 3,600 Yen. After that, in September 2002, Takara released another set of blind-packaged Micromaster combiners, this time a re-release of the Sixturbo team, followed by a "Destron" (Decepticon) redeco of the Sixwing team in February 2003, a redeco of the Sixbuilder team in May 2003 and, finally, a redeco of the Sixtrain team in July 2003 (there was another so-called "Micromaster DX" set, consisting of re-releases of the "Multiforce" members from Takara's 1989 "Transformers: Victory" line, which could merge into Landcross, even though they were technically no "real" Micromasters). Beginning with the Sixturbo team, Takara also started to include recolored "chase" versions of each team member in the blind-packaged sets, which, when assembled, could form "Reverse Evolution" Sixturbo, "Berserker" Sixwing, "Destron" Sixbuilder and "Red Mode" Sixtrain, respectively (and, in Landcross's case, "black" Landcross). 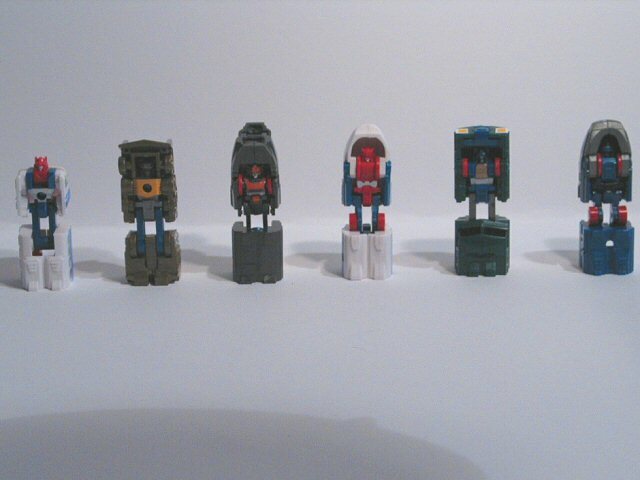 In 2004, Hasbro decided to import the Micromaster combiner teams and release them as part of their "Universe" line, which consisted of redecos of toys from older lines. With the exception of the Target exclusive Nemesis Prime toy, which was a recolor of the Japan-only "Beast Wars Neo" Big Convoy toy, all the other Universe toys released so far were recolors of toys previously released by Hasbro, so the Micromasters were pretty much the only Universe toys which actually had some real "novelty" factor for people who had never bought a Takara toy before. The Hasbro Micromasters (or "MicroMasters", as the name is spelled on the packaging) were exclusively available at KB Toys, with "Series 1", released in May 2004, being an apparently unchanged Hasbro release of Sixturbo, renamed "Defensor" (with the team being appropriately named "Protectobots"), and "Series 2", released in October 2004, being a vastly improved version of the "Destron" recolor of Sixbuilder, renamed "Constructicon Devastator" (the "Constructicon" prefix for the gestalt robot's name being due to trademark reasons; with the team obviously being named "Constructicons"). Even though Hasbro also didn't offer the teams as a set, but only individually packaged retailing for $3.99 each, at least they, unlike Takara, were sane enough to sell them on cards with see-through bubbles and with individual names on the packaging, so people would actually know what they were buying before opening the packaging. The first hint at the third Hasbro MicroMaster team was dropped at the Hasbro panel at OTFCC 2004, when Aaron Archer, the current head of Hasbro's Transformers brand, stated that the third Micromaster combiner team would be "Sixliner" (don't expect anyone at Hasbro to be able to tell the difference between Sixtrain and Sixliner), with the team supposedly being named "Railbots". The first confirmation of the surfacing of a (still all-white) test shot was reported by Chinese fan P.Prime in September 2004, followed seven days later by the first pictures of both an all-white and a partially painted test shot, which confirmed that the Hasbro version would be based on Sixtrain, not Sixliner, apparently in the 2003 Takara reissues' colors. After that, there were several months of silence, aside from a rumor in March 2005 that they had allegedly surfaced in packaging in China but apparently sold out before pictures could be taken… until finally, in June 2005, the first in-packaging pictures showed up, which not only confirmed that the Hasbro version would indeed retain the color schemes of Takara's re-released, recolored version of Sixtrain, but also revealed the names of the individual team members, which consisted of Railspike (Desire), Overload (San Diego), Tankor (Atlan), Midnight Expess (Windy), Swindle (Convertor) and Rapid Run (Raise). Obviously, people were initially confused because the packaging was labelling them as part of the "Cybertron" line and not of "Universe", which was instantly cited by many as yet another "proof" that Universe was "dead"… until someone noticed that the packaging cards contained six languages (English, French, German, Spanish, Italian and Dutch), instead of the usual three (English, Spanish and French) found on standard US Transformers packaging. From there, it was only a small step to the conclusion that this was indeed European packaging, especially since several European countries (including the Netherlands and Scandinavia) had previously gotten the Protectobots and Constructicons on "Energon" cards (since the "Universe" line is not being released in Europe). 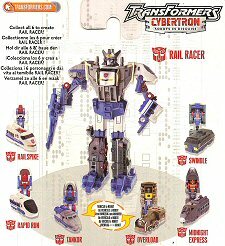 A few weeks later, still in June 2005, the first photo of the back of the packaging confirmed Hasbro's name for the gestalt form, "Rail Racer", a name recycled from the Robots in Disguise toy (Hasbro's version of the Car Robots JRX toy). Another week later, at the beginning of July 2005, an eBay auction from Singapore offered the first look at the American packaging, which not only retained the "Universe" title from the previous two teams, but also sported the name "Railbots" originally brought up by Aaron Archer at the OTFCC 2004 Hasbro panel. Once again only a few days later, an Australian-based online store, Case Fresh, offered a better look at the American packaging, being the first store in the Western hemisphere to have them in stock. With the assortment number (29460) being identical to that of the Protectobot and Constructicon teams, it soon became apparent that the US releases of the Railbots would once again end up being KB Toys exclusives. A month later, at the beginning of August 2005, there were some reported problems with Australian KMart stores stocking the Railbots, but not being able to sell them because they were not listed in their systems yet - fortunately, the problems were quickly resolved within a few days. Again only a few days later, the European "Cybertron" versions were sighted in the Netherlands for the first time (retailing for 4.99 Euros each), with a sighting from Sweden once again following only a few days later (retailing for 69 Swedish Kronor each). Finally, in late August 2005, a fellow German fan informed me that Intertoys, a Dutch retail chain with stores in Germany, was having Cybertron toys, including the Railbots, in stock. Since it had been confirmed several times in the past that Intertoys are receiving their shipments from the Netherlands, and Hasbro Germany are officially not distributing any Transformers toys since the beginning of the year, that meant that we were dealing with toys distributed through Hasbro Netherlands being available in Germany… however, even though Intertoys only have stores in the Northwestern region of Germany (near the Dutch border), I happen to live in that region, and so I was able to pick up a full set of Micromaster Railbots in an Intertoys store in my own city on August 26, 2005, together with Cybertron Ransack and Scattorshot. In other words: I, living in a Transformers-free zone as far as Hasbro Germany are concerned, was able to pick up the Micromaster Railbots locally even before they were officially released in the US. I can't help but feel a sense of satisfaction right now. Well, the first US sighting of the Railbots was finally reported on September 20, and the first receipt pic eventually followed on October 6. Okay, so much for the history lesson - now on to the review. Oh, one more thing, for those wondering: The fourth set of Hasbro Micromaster combiners has been confirmed in early August 2005 to be Hasbro's version of the Sixwing team, recolored as the "Aerialbots", with the gestalt robot being appropriately renamed "Superion" (without the "Maximus" suffix the "Energon" line gave us). With the assortment number still being 29460, look forward to them being available at KB Toys again, probably to be released shortly after the Railbots have come out in the US. At the time of this review, no European release of the Micromaster Aerialbots has been confirmed yet. The name is, of course, recycled from the Robots in Disguise toy (Hasbro's version of the Car Robots J-5 toy), who was a member of the Team Bullet Train, which in turn formed the original Rail Racer, which means the name is more than appropriate. Railspike is Hasbro's version of Takara's 2003 re-release of Micromaster Desire (which was also available as a "red mode" chase version), with identical colors. The only thing that tells the Hasbro version apart from the Takara reissue is a small "'92 '05 © TAKARA CHINA" stamp, whereas the 2003 Takara reissue had a "'92 '03 © TAKARA CHINA" stamp. The original version of Desire, released in 1992 in different colors, was a recolored remold of Spark from the Sixliner team, which in turn was re-released in its original colors in 2002. The remolds are limited to the train mode and include the entire train front, the front window, different doors on the robot mode's arms, four instead of three windows on each side of the robot mode's legs, a different panel layout on the robot mode's shins, and only two instead of four fake "wheels" under the rear section of the train. The reason for this is that Spark and Leaf were supposed to represent two similar kinds of trains (a Tokaido 100 Line Bullet Train and a Tohoku 200-2000 Line Bullet Train, respectively), whereas Desire and Raise (and thus also Railspike and Rapid Run) are meant to be two entirely different models. Accessories: Railspike comes with the chestplate piece for the Rail Racer gestalt robot (the Takara reissue Desire version came with the right foot piece for the Sixtrain gestalt robot). Train mode: Railspike/Desire is based on a Japanese Hokkaido Bullet Train and comes with four red wheels on the underside of the train which allow him to roll on any surface. The primary mold color is white (plus one red and two medium blue pieces on the train's roof, which form the head and the shoulders in robot mode, respectively), with additional paint applications in medium blue (the stripes on the sides of the train), black (the windows), dark gold (the borders of the front window and the middle section of the small stripe on the front of the train), yellow (the outer sides of the small stripe on the front of the train) and red (the Autobot logo on the front of the train). Even though the train mode itself looks quite nice, the blatant open gap on the train's roof, with the exposed robot head, gives Railspike/Desire the worst "disguise" of the entire Railbots team. Railspike/Desire possesses several features in train mode which are not documented in the instructions, but were documented in the instructions of the original 1991 Sixliner release: Like all the Railbots, Railspike comes with a small extendable hitch in the rear section of the train, which allows him to be connected to other Railbots. There are two different versions of hitches, a "male" one (with a small pin on top of it) and a "female" one (with a hole in it for the pin to fit through). Railspike has a "female" hitch and thus can connect with all Railbots with "male" hitches, namely Overload, Swindle and Rapid Run, with either of them forming the front half of the combined train and the other one forming the rear half. Another feature also not documented in the instructions, but documented in the instructions of the original 1991 Sixliner release, allows Railspike to use the hitch to connect to the right foot piece of the Rail Racer gestalt robot, which in turn can be equipped with other Rail Racer parts to form a so-called "military vehicle combiner mode": Attaching the two Rail Racer fists to both sides of the Rail Racer gun and the Rail Racer head to the rear end of the gun and then attaching the gun to the right foot piece gives us the "Gripper Probe", as it was identified in the original 1991 Sixliner release's instructions, whereas attaching the Rail Racer chestplate piece to the right foot piece gives us the "Wingard". Transformation into robot mode: Pretty much a standard Micromaster transformation here: Flip down the rear half of the train 90 degrees to form the legs, turn around Railspike so the train's front is facing away from you, then flip up the red piece 90 degress to reveal the head. Transformation complete. Robot mode: Color-wise, the robot mode is still primarily dominated by white parts (the feet and the arms), although the upper legs and the torso are molded in medium blue and the head in red plastic, with additional paint applications in silver (the hips/waist and the face). In terms of articulation, Railspike is pretty much your average Micromaster: Both arms can swing up 90 degrees at the shoulders, as can the legs at the hips. Unlike most other Micromasters (including the rest of the Railbots team), though, the knees can't bend down 90 degrees, but only get as far as about 25 degrees, which means Railspike isn't able to take the same "seated" position the other Railbots are able to achieve. In return, his head can flip forward 90 degrees, although I wouldn't really count this as a part of the robot mode's articulation. All in all, Railspike is my least favorite of the entire Railbots team, especially with the long train nose sticking out of the back of the robot mode. Transformation: 2 - extremely easy, only two steps, which is one more than for the rest of the Railbots team (except maybe Midnight Express). Durability: 9 - unless you stomp on the toy or give it to your dog to play with, I don't see hoy you could damage it. There is some blue paint chipping in the area where Railspike connects to the Rail Racer chest piece when forming the gestalt robot, but that's not an inherent problem of the toy by itself. Fun: It's a Micromaster, which were debated even back in the G1 days - basically, if you like Micromasters, it's a 7, with the limited articulation even for Micromaster standards, otherwise it's a 2. Price: 5 - depending on where you live, it's 3.99 USD for a single Micromaster with accessories in US KB Toys stores, 4.99 AUD (slightly less than $4) in Australian KMart stores or 35 AUD (ca. $27) for the entire Railbots team at the Case Fresh website, which might seem a little high, but 4.99 Euros (more than $6) in Dutch stores or 69 Swedish Kronor (more than $9!) in Swedish stores is certainly worse. The Japanese version originally retailed for 300 Yen (less than $3) per Micromaster, although it was blind-packaged in return and thus you wouldn't know beforehand which Micromaster you were actually getting. Summary: 5 - my least favorite of the Railbots team, but still a hundred times better than the Japanese repaint of the Armada Nightbeat Mini-Con I recently got for free. The name is, of course, recycled from the Generation 1 Micromaster toy as well as the Armada toy, the latter of which was later also available as a Costco exclusive recolor released under the "Energon" banner. Even with the lack of any previous Transformers toys named "Overload" with a train as their alternate mode, the name does fit the "theme" and thus is this the best choice among the three "new" names Hasbro attributed to the Railbots' team members, even though there is already a Micromaster toy with the same name. Overload is Hasbro's version of Takara's 2003 re-release of Micromaster San Diego (which was also available as a "red mode" chase version), with identical colors. The only thing that tells the Hasbro version apart from the Takara reissue is a small "'92 '05 © TAKARA CHINA" stamp, whereas the 2003 Takara reissue had a "'92 '03 © TAKARA CHINA" stamp. The original version of San Diego, released in 1992 in different colors, was a straight recolor of Deego (aka "Diego") from the Sixliner team, which in turn was re-released in its original colors in 2002. Accessories: Overload comes with the thighs piece for the Rail Racer gestalt robot (the Takara reissue San Diego version came with the head as well as the gun for the Sixtrain gestalt robot). Train mode: Overload/San Diego, as well as Deego, is based on an old steam locomotive and comes with four dark gold wheels on the underside of the train which allow him to roll on any surface. The primary mold color is dark gold (plus a red tab on the roof of the train's driver's cab, which is used for connecting Overload to the thighs piece for the Rail Racer gestalt robot), with additional paint applications in silver (the detailings on the sides and the front of the train), black (the windows), red (the Autobot logo on the front of the train) and white (the borders of the Autobot logo). Being different from all the other high speed trains in the team (with the exception of Swindle/Convertor), coupled with the dark gold color and some really nice detailing, Overload's train mode is my favorite among the Railbots. With the exception of Astrotrain, Overload/San Diego (and Deego) is Hasbro/Takara's only ever attempt of creating a Transformers toy that transformers into a steam locomotive, and unlike Astrotrain, whose design suffers from the triple-changing ability, the result is quite well done especially considering the limitations because of the Micromaster size. Overload/San Diego possesses several features in train mode which are not documented in the instructions, but were documented in the instructions of the original 1991 Sixliner release: Like all the Railbots, Overload comes with a small extendable hitch in the rear section of the train, which allows him to be connected to other Railbots. There are two different versions of hitches, a "male" one (with a small pin on top of it) and a "female" one (with a hole in it for the pin to fit through). Overload has a "male" hitch and thus can connect with all Railbots with "female" hitches, namely Railspike, Tankor and Midnight Express, with either of them forming the front half of the combined train and the other one forming the rear half. Another feature also not documented in the instructions, but documented in the instructions of the original 1991 Sixliner release, allows Overload to use the hitch to connect to the left foot piece of the Rail Racer gestalt robot, which in turn can be equipped with other Rail Racer parts to form a so-called "military vehicle combiner mode": Attaching the two Rail Racer fists to both sides of the Rail Racer gun and the Rail Racer head to the rear end of the gun and then attaching the gun to the left foot piece gives us the "Gripper Probe", as it was identified in the original 1991 Sixliner release's instructions, whereas attaching the Rail Racer chestplate piece to the left foot piece gives us the "Wingard". Additionally, the Rail Racer thighs piece can be connected to the small hole in the middle of the red tab on the roof of the train's driver's cab, which gives us the "Mega-Techvolt". Overload can still be connected to Railspike, Tankor or Midnight Express while in Mega-Techvolt mode, and he can alternatively also connect to the left foot piece of the Rail Racer gestalt robot, but the additional Rail Racer pieces wouldn't fit on the left foot piece anymore in that case unless facing the opposite direction, hence there can be no "Gripper Probe Mega-Techvolt" or "Wingard Mega-Techvolt". Transformation into robot mode: A standard Micromaster transformation here: Flip down the rear half of the train 90 degrees to form the legs. Transformation complete. Robot mode: Color-wise, the robot mode is still primarily dominated by dark gold parts (the feet, the arms and the casing around the head), although the upper legs are molded in medium blue and the torso/head in medium grey plastic, with additional painted paint applications in yellow (the chest). In terms of articulation, Overload is your average Micromaster: Both arms can swing up ca. 115 degrees at the shoulders, the legs can swing up 90 degrees at the hips, and the knees can bend down 90 degrees, putting Overload into some sort of "seated" position. Out of all the Railbots, that position looks by far the best on Overload. As with the train mode, Overload's robot mode is also my favorite among the Railbots, well-proportioned and with good articulation for Micromaster standards. Transformation: 1 - extremely easy, only one simple step. It doesn't get much easier than that. Durability: 9 - again, unless you heavily abuse it in whatever way, I don't see how you could damage the toy. Fun: A Micromaster with articulation on par with/slightly above Micromaster standards - if you like Micromasters, it's an 8, otherwise it's a 3. Summary: 7 - my favorite of the Railbots team. Well-proportioned in robot mode, articulation works just fine, and a really cool, well-detailed train mode. The name is, of course, recycled from the Beast Machines toy, which was later also available as a recolor released as part of the "Universe" line. Ever since the individual names of the Railbots' team members had originally been confirmed, "Tankor", together with "Swindle", has been heavily debated. One of the problems with the name is that, even though there are of course tanker trains, Tankor is none of them. The other problem is that the name had previously been associated with "evil" characters, the first of them being one of the Beast Machines Vehicon generals, who later turned out to be the original Beast Wars character Rhinox after having been corrupted by Megatron, and the other being a Universe recolor of the Beast Machines toy, which is presumably the same character, this time serving as one of Unicron's agents of chaos. So of all the names Hasbro attributed to the Railbots' team members, "Tankor", together with "Swindle", is, without a doubt, one of the worst. Tankor is Hasbro's version of Takara's 2003 re-release of Micromaster Atlan (which was also available as a "red mode" chase version), with identical colors. The only thing that tells the Hasbro version apart from the Takara reissue is a small "'92 '05 © TAKARA CHINA" stamp, whereas the 2003 Takara reissue had a "'92 '03 © TAKARA CHINA" stamp. The original version of Atlan, released in 1992 in different colors, was a straight recolor of Alan (aka "Aran") from the Sixliner team, which in turn was re-released in its original colors in 2002. Accessories: Tankor comes with the head as well as the gun for the Rail Racer gestalt robot (the Takara reissue Atlan version came with the thighs piece for the Sixtrain gestalt robot). Train mode: Tankor/Atlan, as well as Alan, is based on a French TGV-A (Train à Grande Vitesse) and comes with four red wheels on the underside of the train which allow him to roll on any surface. The primary mold colors are medium grey (the front half of the train) and medium blue (the rear half of the train), with additional paint applications in medium blue (stripes on the sides of the front half of the train), medium grey (stripes on the sides of the rear half of the train), silver (the sections with the "TGV" logo on both sides of the rear half of the train), black (the windows), red (the Autobot logo on the train's roof) and white (the borders of the Autobot logo). Tankor/Atlan is an accurate recreation of the TGV's trademark body shape and would be recognizable even if it wasn't for the huge "TGV" logos on both sides of the train. The only letdown is the mismateched shade of grey between the more silver-ish grey on the front half of the train and the painted grey details on the panels on both sides of the front half of the train (which form the arms in robot mode) and the the underside of the rear half of the train, which are kept in a notably more brown-ish shade of grey. Tankor/Atlan possesses several features in train mode which are not documented in the instructions, but were documented in the instructions of the original 1991 Sixliner release: Like all the Railbots, Tankor comes with a small extendable hitch in the rear section of the train, which allows him to be connected to other Railbots. There are two different versions of hitches, a "male" one (with a small pin on top of it) and a "female" one (with a hole in it for the pin to fit through). Tankor has a "female" hitch and thus can connect with all Railbots with "male" hitches, namely Overload, Swindle and Rapid Run, with either of them forming the front half of the combined train and the other one forming the rear half. Another feature also not documented in the instructions, but documented in the instructions of the original 1991 Sixliner release, allows Tankor to use the hitch to connect to the right foot piece of the Rail Racer gestalt robot, which in turn can be equipped with other Rail Racer parts to form a so-called "military vehicle combiner mode": Attaching the two Rail Racer fists to both sides of the Rail Racer gun and the Rail Racer head to the rear end of the gun and then attaching the gun to the right foot piece gives us the "Gripper Probe", as it was identified in the original 1991 Sixliner release's instructions, whereas attaching the Rail Racer chestplate piece to the right foot piece gives us the "Wingard". Additionally, the Rail Racer thighs piece can be connected to a small hole on the train's roof, similar to Overload's "Mega-Techvolt", although the thighs piece would face the opposite direction from how it does on Overload. Unlike Overload, Tankor can't connect to any other Railbots anymore in this combined mode, and although he can still connect to the right foot piece of the Rail Racer gestalt robot, the additional Rail Racer pieces wouldn't fit on the right foot piece anymore in that case unless facing the opposite direction, just like in Overload's case. Transformation into robot mode: Pretty much a standard Micromaster transformation here: Flip around the rear half of the train 180 degrees to form the legs. Transformation complete. Robot mode: Color-wise, the robot mode is primarily dominated by medium blue parts (the feet, the upper legs, the torso/head and the arms), although the casing around the head is molded in medium grey, and the wheels for the train, which are visible in robot mode, are molded in red, with additional paint applications in black (the hips and the visor that covers the eyes) and silver (the face). In terms of articulation, Tankor is your average Micromaster: Both arms can swing up 90 degrees at the shoulders, the legs can swing up 90 degrees at the hips, and the knees can bend down 90 degrees, putting Tankor into some sort of "seated" position, although that position looks somewhat awkward due to the rather long upper legs. Transformation: 1 - very easy, only one simple step. The additional transformation mechanism used for turning Tankor into one of the Rail Racer gestalt robot's arms helps making it even more easy. Durability: 9 - once again, there's nothing really you could break on the toy unless you use extreme force for whatever reason. Fun: A Micromaster with standard Micromaster articulation - if you like Micromasters, it's an 8, otherwise it's a 3. Summary: 6 - a nice Micromaster but with somewhat misporportioned legs if you put him into a "seated" position. The name is, of course, recycled from the Robots in Disguise toy (Hasbro's version of the Car Robots J-4 toy), who was a member of the Team Bullet Train, which in turn formed the original Rail Racer, which means the name is more than appropriate. Midnight Express is Hasbro's version of Takara's 2003 re-release of Micromaster Windy (which was also available as a "red mode" chase version), with identical colors. The only thing that tells the Hasbro version apart from the Takara reissue is a small "'92 '05 © TAKARA CHINA" stamp, whereas the 2003 Takara reissue had a "'92 '03 © TAKARA CHINA" stamp. The original version of Windy, released in 1992 in different colors, was an entirely new mold that shared no parts with Joe from the Sixliner team (whose train mode was a Super Hitachi 651 Line Limited Express Train), which in turn was re-released in its original colors in 2002. Accessories: Midnight Express comes with the left foot piece for the Rail Racer gestalt robot (the Takara reissue Windy version came with the left and right fists for the Sixtrain gestalt robot). Train mode: Midnight Express/Windy is based on a Japanese Yamagata Bullet Train and comes with four red wheels on the underside of the train which allow him to roll on any surface. The primary mold color is dark grey, with additional paint applications in black (the windows), turquoise (the borders of the windows on the sides of the train), dark gold (the borders of the front window), silver (the nose of the train), red (the Autobot logo on the right side of the train) and white (the borders of the Autobot logo). The train mode itself is once quite again well done, althrough the hinges between the train's nose and the front window look rather out of place. It's not as bad as the glaring gap on the roof of Railspike's train mode, however, it means Midnight Express/Windy has the second worse "disguise" among the Railbots. Midnight Express/Windy possesses several features in train mode which are not documented in the instructions, but were documented in the instructions of the original 1991 Sixliner release: Like all the Railbots, Midnight Express comes with a small extendable hitch in the rear section of the train, which allows him to be connected to other Railbots. There are two different versions of hitches, a "male" one (with a small pin on top of it) and a "female" one (with a hole in it for the pin to fit through). Midnight Express has a "female" hitch and thus can connect with all Railbots with "male" hitches, namely Overload, Swindle and Rapid Run, with either of them forming the front half of the combined train and the other one forming the rear half. Another feature also not documented in the instructions, but documented in the instructions of the original 1991 Sixliner release, allows Midnight Express to use the hitch to connect to the right foot piece of the Rail Racer gestalt robot, which in turn can be equipped with other Rail Racer parts to form a so-called "military vehicle combiner mode": Attaching the two Rail Racer fists to both sides of the Rail Racer gun and the Rail Racer head to the rear end of the gun and then attaching the gun to the right foot piece gives us the "Gripper Probe", as it was identified in the original 1991 Sixliner release's instructions, whereas attaching the Rail Racer chestplate piece to the right foot piece gives us the "Wingard". Transformation into robot mode: Pretty much a standard Micromaster transformation here: Flip around the rear half of the train 180 degrees to form the legs. Transformation complete. It is possible to flip back the train mode's nose (which is above the robot mode's head) 180 degrees to give him less of a "big hat" look, although this feature is documented neither in the Hasbro nor in the Takara version's instructions. Robot mode: Color-wise, the robot mode is still primarily dominated by dark grey parts (the feet, the upper legs, the torso, the arms and the casing around the head), although two of the wheels for the train, which are visible in robot mode, are molded in red, with additional paint applications in orange (a panel on the waist, the chest and the head) and silver (the waist, the face and the train mode's nose above the head, depending on whether you flipped it back or not). In terms of articulation, Midnight Express is your average Micromaster: Both arms can swing up ca. 100 degrees at the shoulders, the legs can swing up 90 degrees at the hips, and the knees can bend down 90 degrees, putting Midnight Express into some sort of "seated" position, although that position looks somewhat awkward due to the rather long upper legs. The "big hat" look of the train mode's nose above the robot's head is somewhat annoying, but as I mentioned before, you can solve that by flipping back the nose, even though this step is not documented in the instructions. It's worth pointing out that the Takara reissue's bio identifies Windy as a female Transformer, although this shouldn't have any implications on the Hasbro version, seeing as RiD Midnight Express, whom the Micromaster is supposedly a new version of, was a male robot. Transformation: 1 - very easy, only one simple step if you strictly go by the instructions, or two if you flip back the train mode's nose. Durability: 8 - the only thing I could see snapping off when not handled properly would be the hinges of the train mode's nose. Other than that, there's not much to damage unless you do something really stupid to the toy. Summary: 6 - a nice Micromaster but with somewhat misporportioned legs if you put him into a "seated" position, whereas the problem of the "big hat" look can be solved easily. The name is, of course, recycled from the Generation 1 Combaticon toy, which was also available as a Generation 2 recolor, the Armada Mini-Con toy, which was also available as a "Built to Rule" version, and the Alternators toy. Ever since the individual names of the Railbots' team members had been confirmed, "Swindle", together with "Tankor", has been heavily debated. The primary problem with the name is that the name had previously been associated with "evil" characters, the first of them being a member of the Generation 1 Combaticons, later also available as a "Generation 2" version, then later a Mini-Con that was Starscream's partner in "Armada", and finally the Alternators toy, which is supposedly the same character as the Combaticon. Additionally, the name "Swindle", even without being previously attributed to Decepticons and Decepticon-related characters, doesn't exactly sound like Autobot material to begin with. So of all the names Hasbro attributed to the Railbots' team members, "Swindle", together with "Tankor", is, without a doubt, one of the worst. Swindle is Hasbro's version of Takara's 2003 re-release of Micromaster Convertor (which was also available as a "red mode" chase version), with identical colors. The only thing that tells the Hasbro version apart from the Takara reissue is a small "'92 '05 © TAKARA CHINA" stamp, whereas the 2003 Takara reissue had a "'92 '03 © TAKARA CHINA" stamp. The original version of Convertor, released in 1992 in different colors, was a straight recolor of Night from the Sixliner team, which in turn was re-released in its original colors in 2002. Accessories: Swindle comes with the right foot piece for the Rail Racer gestalt robot (the Takara reissue Convertor version came with the chestplate piece for the Sixtrain gestalt robot). Train mode: Swindle/Convertor, as well as Night, is based on a Japanese EF66 Freight Train and comes with four red wheels on the underside of the train which allow him to roll on any surface. The primary mold color is dark green (plus a medium blue panel on the front of the train, which is used for transforming Swindle into Rail Racer's left leg), with additional paint applications in black (the windows), yellow (the headlights of the train), red (the Autobot logo on the left side of the train) and white (the borders of both the Autobot logo and the headlights and the stripes on both sides of the train). Aside from Overload, Swindle/Convertor is the only Railbot whose train mode isn't based on a high speed train, and what's even better is that he has a "real" rear section complete with windows, which means he can be viewed from both ends, even though the rear section is missing the headlights and has an open gap which gives away the disguise when viewed from this end. Still, the design of the train mode is quite well done, and the details add a lot to it. Swindle/Convertor possesses several features in train mode which are not documented in the instructions, but were documented in the instructions of the original 1991 Sixliner release: Like all the Railbots, Swindle comes with a small extendable hitch in the rear section of the train, which allows him to be connected to other Railbots. There are two different versions of hitches, a "male" one (with a small pin on top of it) and a "female" one (with a hole in it for the pin to fit through). Swindle has a "male" hitch and thus can connect with all Railbots with "female" hitches, namely Railspike, Tankor and Midnight Express, with either of them forming the front half of the combined train and the other one forming the rear half. Another feature also not documented in the instructions, but documented in the instructions of the original 1991 Sixliner release, allows Swindle to use the hitch to connect to the left foot piece of the Rail Racer gestalt robot, which in turn can be equipped with other Rail Racer parts to form a so-called "military vehicle combiner mode": Attaching the two Rail Racer fists to both sides of the Rail Racer gun and the Rail Racer head to the rear end of the gun and then attaching the gun to the left foot piece gives us the "Gripper Probe", as it was identified in the original 1991 Sixliner release's instructions, whereas attaching the Rail Racer chestplate piece to the left foot piece gives us the "Wingard". Robot mode: Color-wise, the robot mode is still primarily dominated by dark green parts (the feet, the arms and the casing around the head), although the upper legs are molded in medium grey, the torso/head and a section above the head, which is used for transforming Swindle into Rail Racer's left leg, are molded in medium blue, and two of the wheels for the train, which are visible in robot mode, are molded in red, with additional paint applications in black (the train mode's rear windows, which are visible in robot mode), silver (the waist and the face) and gold (the chest and the visor that covers the eyes). In terms of articulation, Swindle is your average Micromaster: Both arms can swing up ca. 105 degrees at the shoulders, the legs can swing up 90 degrees at the hips, and the knees can bend down 90 degrees, putting Swindle into some sort of "seated" position. Transformation: 1 - very easy, only one simple step. Nothing a five-year old coudn't figure out even without the instructions. Durability: 9 - as with the other Railbots, there shouldn't be much to worry about as long as you handle the toy properly. Summary: 7 - my second favorite of the Railbots team. Proportions in robot mode are slightly off, but articulation works just fine nevertheless. Rapid Run is Hasbro's version of Takara's 2003 re-release of Micromaster Raise (which was also available as a "red mode" chase version), with identical colors. The only thing that tells the Hasbro version apart from the Takara reissue is a small "'92 '05 © TAKARA CHINA" stamp, whereas the 2003 Takara reissue had a "'92 '03 © TAKARA CHINA" stamp. The original version of Raise, released in 1992 in different colors, was a recolored remold of Leaf (aka "Leif") from the Sixliner team, which in turn was re-released in its original colors in 2002. The remolds are limited to the train mode and include the entire train front, the front window, different doors, four instead of three windows on each side of the train and a different roof, which means differently-looking feet in robot mode. The reason for this is that Leaf and Spark were supposed to represent two similar kinds of trains (a Tohoku 200-2000 Line Bullet Train and a Tokaido 100 Line Bullet Train, respectively), whereas Raise and Desire (and thus also Rapid Run and Railspike) are meant to be two entirely different models. Accessories: Rapid Run comes with the left and right fists for the Rail Racer gestalt robot (the Takara reissue Raise version came with the left foot piece for the Sixtrain gestalt robot). Train mode: Rapid Run/Raise is based on a Japanese Limited Express Train and comes with four red wheels on the underside of the train which allow him to roll on any surface. The primary mold color is white (plus two medium blue panels on both sides of the front half of the train, which form the arms in robot mode), with additional paint applications in black (the windows), medium blue (the borders of the windows and the stripes on the sides of the train and the underside of the rear half of the train), dark grey (the borders of the front window) and red (the Autobot logo on the train's roof). The train mode itself is once agail well done, especially the large front window.The only letdown is the mismateched shade of blue between the darker blue panels on both sides of the front half of the train (which form the arms in robot mode) and the painted blue details on the underside of the rear half of the train, which are kept in a notably lighter shade of blue. Also, since the upper section of the blue panels/arms does not have any white painted details, the difference is even more glaring. Rapid Run/Raise possesses several features in train mode which are not documented in the instructions, but were documented in the instructions of the original 1991 Sixliner release: Like all the Railbots, Rapid Run comes with a small extendable hitch in the rear section of the train, which allows him to be connected to other Railbots. There are two different versions of hitches, a "male" one (with a small pin on top of it) and a "female" one (with a hole in it for the pin to fit through). Rapid Run has a "male" hitch and thus can connect with all Railbots with "female" hitches, namely Railspike, Tankor and Midnight Express, with either of them forming the front half of the combined train and the other one forming the rear half. Another feature also not documented in the instructions, but documented in the instructions of the original 1991 Sixliner release, allows Rapid Run to use the hitch to connect to the left foot piece of the Rail Racer gestalt robot, which in turn can be equipped with other Rail Racer parts to form a so-called "military vehicle combiner mode": Attaching the two Rail Racer fists to both sides of the Rail Racer gun and the Rail Racer head to the rear end of the gun and then attaching the gun to the left foot piece gives us the "Gripper Probe", as it was identified in the original 1991 Sixliner release's instructions, whereas attaching the Rail Racer chestplate piece to the left foot piece gives us the "Wingard". Robot mode: Color-wise, the robot mode is equally dominated by white (the legs and the casing around the head), medium blue (the upper legs and the arms) and red parts (the torso/head and the wheels for the train, which are visible in robot mode), with additional paint applications in silver (the waist and the face). In terms of articulation, Rapid Run is your average Micromaster: Both arms can swing up ca. 85 degrees at the shoulders, the legs can swing up 90 degrees at the hips, and the knees can bend down 90 degrees, putting Rapid Run into some sort of "seated" position, although that position looks somewhat awkward due to the rather long upper legs. Transformation: 1 - very easy, only one simple step. The additional transformation mechanism used for turning Rapid Run into one of the Rail Racer gestalt robot's arms helps making it even more easy. Durability: 9 - as usual, there's nothing really you could break on the toy unless you use excessive force for no apparent reason. Summary: 6 - as with Tankor, a nice Micromaster but with somewhat misporportioned legs if you put him into a "seated" position. As noted above, the name is recycled from the Robots in Disguise toy (Hasbro's version of the Car Robots JRX toy), who was the merged form of the Team Bullet Train consisting of Railspike, Midnight Express and Rapid Run, which means the name is more than appropriate. Transformation into gestalt robot mode: For merging the six Railbots into Rail Racer, you need to have Railspike, Overload, Tankor and Rapid Run in robot mode, and Midnight Express and Swindle in train mode. Start with Railspike, swing his arms up 90 degrees to give the legs the needed clearance, then swing the lower legs foward (!) 90 degrees at the knees and finally put the arms back into their original position. Turn Railspike aroung so the train's front is facing you, then attach him to the Rail Racer chest piece by pushing the train's front through the big gap until Railspike's feet are snapping into the two tabs on the chest piece. Attach the small pin on the lower end of the chest piece to the matching hole on the Rail Racer thighs piece. Turn around the Railspike/chest piece/thighs piece combination so Railspike's train front is once again facing away from you, then turn Overload around so his train front is facing you and his robot face is facing up. Attach the small pin in the middle of the Rail Racer thighs piece to the hole in the middle of the red tab under Overload's feet (the roof of the driver's cab in train mode), then swing Overload's lower legs foward (!) 90 degrees at the knees until his chest touches the underside of Railspike's feet. Turn around the Railspike/chest piece/thighs piece/Overload combination again so Railspike's train front is again facing you. Take Swindle and flip out the hitch used to connect him to other Railbots or Rail Racer's left foot pice. Take the left foot piece and place it so the two round sections on both sides of the foot piece are facing you, then turn around Swindle so the hitch is facing down and the train's roof is facing right. Attach Swindle's hitch to the small hole on the left side of the left foot piece. Now repeat the same procedure with Midnight Express and the right foot piece, but have the roof of the train mode facing left instead of right before connecting Midnight Express to the right foot piece. Flip around the blue panel on Swindle's train front ca. 105 degrees, then attach the two tabs on the upper left leg on the Rail Racer thighs piece (from Rail Racer's perspective) to the now opened hole on Swindle's train front. Flip back the train nose on Midnight Express 180 degrees and attach the two tabs on the upper right leg on the Rail Racer thighs piece (from Rail Racer's perspective) to the now opened hole on Midnight Expess. Take Tankor and swing up his arms 90 degrees. Now swing forward the front half of the train on his back until the arms are facing down again, but have the torso (and the head) maintain their upright position. Turn around Tankor so the train front is facing left, then attack Rail Racer's right fist to the bottom of his legs by having the gun that's attached to his fist on the left side. Now repeat the same procedure with Rapid Run and the left fist, but have the train front facing right instead of left before connecting the fist to Rapid Run. Connect the pin on the right side of Rail Racer's chest piece (from Rail Racer's perspective) to the hole in the middle of the red tab on the opposite side of Tankor's train front, then connect the pin on the left side of Rail Racer's chest piece (from Rail Racer's perspective) to the hole in the middle of the red tab on the opposite side of Rapid Run's train front. Attach Railspike's head to the hole on the underside of Rail Racer's head, then put Rail Racer's gun into whichever fist you prefer. Transformation complete. Even though Rail Racer is no "Scramble City" style combiner with interchangeable limbs, it's possible to achieve an alternate transformation not documented in the instructions by swapping Tankor and Rapid Run to form his left and right arms, respectively. Robot mode: The robot mode, which is about the same size as Alternators Smokescreen in robot mode, is a mix of all sorts of colors, with blue, white, green and different shades of grey/silver being the predominant ones. When viewed from the front, three Autobot logos are visible on Rail Racer, one of them being on the chest (the train front of Railspike) and the other two being on the legs (Midnight Express and Swindle). Two more Autobot symbols are located on the top of the shoulders (the roofs of the front halves of Tankor's and Rapid Run's train modes). 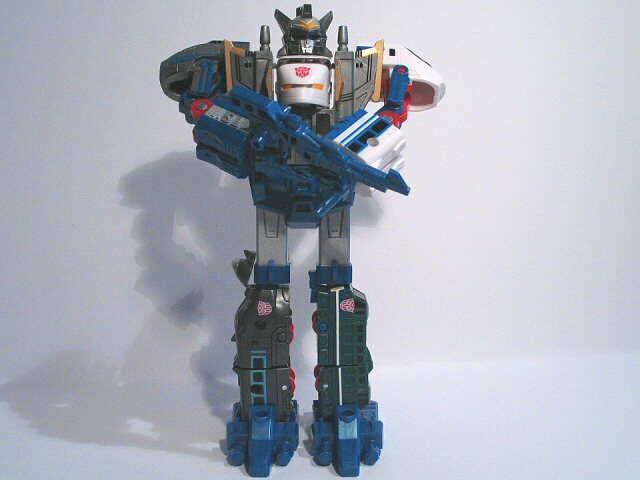 The head sculpt, being based on the original 1992 Takara release of Sixtrain, obviously sports no similarities to the RiD Rail Racer gestalt robot's head sculpt. It's also worth ponting out that Overload serves no real purpose in gestalt mode, since he forms the backside of Rail Racer and isn't even visible when viewed from the front. In fact, if Overload was missing from the gestalt mode, it wouldn't make a difference, and if you didn't know that the Micromaster combiners all consist of six robots, you wouldn't even notice that one of them was missing. In terms of articulation, Rail Racer is only slightly above the G1 Devastator level. The legs, which are formed very similar to how G1 Devastator's legs are formed, aren't articulated at all, and this the only points of articulation are the shoulders, which allow the arms to swing forward and do a full 360 degree swing, three independent hinges on each of the arms, which are used for the transformations of Midnight Express and Rapid Run, and which give Rail Racer some sort of elbow articulation, and last but not least the head, which not only can do a full 360 degree turn, but also flip back ca. 45 degrees by using the hinge of Railspike's head. Overall, Rail Racer possesses the standard articulation of any G1 toy (with the exception of maybe the Throttlebots or the Duocons), which, coupled with the combining ability, makes a fun toy for everyone who likes the G1 toys and especially Micromasters. Oh, and just for the record: All the extra pieces used for forming the Rail Racer gestalt robot are straight recolors of the extra pieces from the Japanese Sixliner team, with the exception of the head sculpt, which is an entirely new mold that was originally introduced with the original 1992 release of Sixtrain. Transformation: 3 - nothing particularly stellar, especially if you follow the instructions. The alternative transformation achieved by swapping Tankor and Rapid Run is a welcome extra. Durability: 7 - I noticed two problems: First, I could see the tabs used to connect the upper legs on Rail Racer thighs piece to Midnight Express and Swindle snapping off if not handled properly. In fact, the outer tab on the left leg is already showing minor stress marks, so make sure you flip out the blue panel on Swindle's front first before detaching the leg. Second, I noticed that some of the blue paint on Railspike has chipped off in the area where he connects to the Rail Racer chest piece, and I couldn't really see how this could be prevented. Other than that, though, I can't really see any way to severely damage Rail Racer unless you handle him particularly poorly. Fun: Standard G1 articulation plus combining ability similarly to G1 Devastator, so if you like G1 toys, it's an 8, otherwise it's a 4. Price: 5 - depending on where you live, it's 23.94 USD for all six Micromasters including accessories in US KB Toys stores, 29.94 AUD (slightly more than $23) in Australian KMart stores or 35 AUD (ca. $27) for the entire Railbots team at the Case Fresh website, which might seem okay, but 29.94 Euros (more than $37) in Dutch stores or 414 Swedish Kronor (about $55!) in Swedish stores is not so good. The Japanese versions originally retailed for 1,800 Yen (a little more than $16) for six Micromasters, or 3,600 Yen (about $32.50) for a case of 12, although they were blind-packaged in return and thus you wouldn't know beforehand which Micromasters you were actually getting. Summary: 6 - all the fun of a G1 toy with okay articulation and actually quite nice considering the size of the gestalt's components.